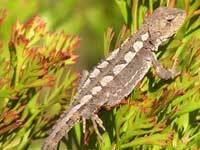 The Mountain Dragon is one of the smallest lizards that bears the name dragon. 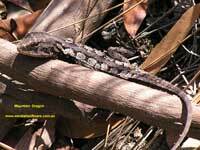 They grow to around 20cm in length and can be found from the Blue Mountains to Victoria as well as Tasmania. The mature individual at the top was spotted gamely basking on a Broad-leaf Drumsticks. 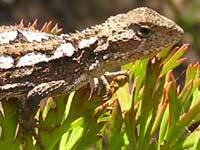 However, they usually blend in so well that they go unnoticed - like the one to the left. 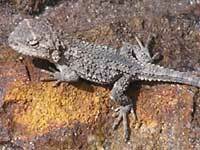 Mountain Dragons are very similar in appearance to Jacky Lizards. References advise that a primary difference is the colour of their mouths - Mountain Dragon's are blue and Jacky Lizards are yellow. As my subjects remained tight-lipped, I can not be 100% sure that they are all Mountain Dragons - although I am reasonably sure that they are. 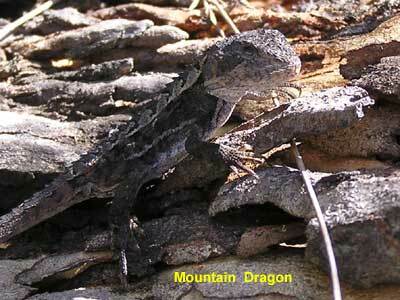 Mountain Dragons are oviparous - that is, they lay eggs. 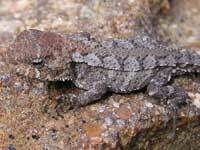 The small juveniles - barely 7cm in length - are fond of little black ants. These photos were taken in the upper Blue Mountains. Additional images of the Mountain Dragon.